On January 14, the Food and Drug Administration approved the multikinase inhibitor Cabometyx (cabozantinib) for people with previously treated hepatocellular carcinoma (HCC), the most common type of liver cancer. This approval was based on a clinical trial showing that Cabometyx improved both progression-free survival—meaning patients were still alive without worsening of disease—and overall survival in people previously treated with Nexavar (sorafenib). The approval of Cabometyx for HCC comes soon after the approval of another kinase inhibitor, Lenvima (lenvatinib), last August and the checkpoint inhibitor Keytruda (pembrolizumab) for liver cancer in November. Over years or decades, chronic hepatitis B or C, heavy alcohol use, fatty liver disease and other causes of liver injury can lead to the development of cirrhosis and liver cancer. About 42,000 people will be diagnosed with liver cancer and nearly 31,800 will die of it this year, according to the American Cancer Society. Liver cancer is often detected late and is difficult to treat. Nexavar is the standard first-line therapy for HCC, but most people who use it experience disease progression. Lenvima is also approved for initial treatment of HCC. Another targeted therapy, Stivarga (regorafenib), is approved for second-line HCC treatment after trying Nexavar, like Cabometyx. All these drugs are kinase inhibitors that interfere with multiple tyrosine kinase pathways, including VEGF and RET, that play a role in cancer cell growth and formation of blood vessels that supply tumors. The Phase III CELESTIAL trial, sponsored by Exelixis, evaluated Cabometyx in 707 people with advanced liver cancer previously treated with Nexavar. Most were men and the median age was 64. About 40 percent had hepatitis B, a quarter had hepatitis C, about 20 percent had alcohol-related liver disease and about 10 percent had non-alcoholic steatohepatitis. Nearly 80 percent had metastatic cancer that had spread beyond the liver. The study was stopped early in October 2017 after a promising interim analysis. Results were published in The New England Journal of Medicine. The median overall survival was 10.2 months for participants randomly assigned to Cabometyx versus 8.0 months for those assigned to the placebo control group. The median progression-free survival was 5.2 months versus 1.9 months, respectively—a 56 percent reduction in the risk of disease progression or death. Both differences were statistically significant, meaning they probably weren’t attributable to chance alone. The objective response rate, meaning complete or partial tumor shrinkage, was low in both groups (4 percent versus 0.4 percent, respectively). However, twice as many people taking Cabometyx had either partial response or stable disease, meaning no progression (64 percent versus 33 percent). Treatment with Cabometyx is generally safe and well tolerated. The most common adverse events include diarrhea, fatigue, loss of appetite, nausea, vomiting, high blood pressure and hand-foot syndrome (palmar-plantar erythrodysesthesia, or redness, swelling and pain on the palms of the hands and soles of the feet). In the CELESTIAL study, 17 percent of people treated with Cabometyx developed severe hand-foot syndrome compared with none of those who took the placebo. Overall, 16 percent of patients taking Cabometyx and 3 percent of those in the placebo arm discontinued treatment because of side effects. Studies are currently under way to test Cabometyx alone and in combination with the checkpoint inhibitor Tecentriq (atezolizumab) as a first-line treatment for liver cancer. “While we’ve seen some progress in the treatment of primary liver cancer in recent years, the patient community still needs new and better options. The approval of Cabometyx has been eagerly anticipated, making this an important day for patients diagnosed with this devastating disease,” said Andrea Wilson, president of the liver cancer patient advocacy group Blue Faery. Click here for full prescribing information for Cabometyx. Click here to learn more about liver cancer. 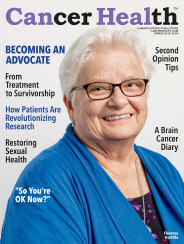 Click here to read Rick George’s story about surviving with liver cancer in the Winter issue of Cancer Health magazine.